This post has been moved to the new Virology Down Under platform on Wordpress. We (Dr @kat_arden and I) were invited to contribute one part to a four-part series in The Conversation this week - and after a lot of no...yes/no/yes from yours truly (I do that a lot these days), we put this piece together. Another year, another outbreak of Ebola virus disease (EVD) overcome in the Democratic Republic of the Congo with the help of a mix of expert local skill and knowledge, isolation and rapid global response. The World Health Organization have summed up the end of an outbreak in which 4 died, 5 cases were lab confirmed and there were a total of 8 likely EVD cases. After 19 years, our furry family member had to leave us this Wednesday. His quality of life was decreasing and he had stopped eating - he made the call and he let us know. He is missed enormously and remembered daily by his human family, for many things. He saw two PhDs completed; he sat through the writing of 70+ papers, a book, 14 chapters, 11 reviews (all had late night writing components that required pats and scratches), he watched over the growth of two babies and has been with them all their lives; he lived in the two houses my family have known; he was a constant companion to my wife and he kept me (and my keyboard) company while I wrote many pieces for this blog. May the Fence be with you. Sometimes, the Middle East respiratory syndrome coronavirus (MERS-CoV) is detected in a person who is not ill.
Not really. This is the result of laboratory testing of contacts of a known and infected person during the process of containing a potential outbreak. For me personally, this is one big question about new or emerging viral infections or infections we are still learning about - like new influenza viruses, MERS-CoV, ebolaviruses and Zika virus. Do we really know how often a laboratory-confirmed infected person with mild or no illness can spread virus to a new person - an uninfected potential host? Are our tools up to the job of detecting what's happening and are we using them properly? Conventional wisdom is that truly asymptomatic but virus infected people do not infect others around them, or if they do, it's a pretty rare event. Because the risk is seen as low, studies around this issue are often down the list of research priorities. The importance of this issue lies in whether mild or asymptomatic people need to be more closely considered as having a role in spreading virus and contributing to community or hospital outbreaks. Emerging from the 2015 South Korean MERS-CoV outbreak, a recent report described the findings from laboratory testing of 82 contacts of an asymptomatic healthcare worker. No other person became MERS-CoV positive. I have some issues with the fact that the nurse herself does not seem to have been tested to show that she developed antibodies to MERS-CoV and there also isn't a lot of discussion about how the PCR testing for MERS-CoV can be a bit "flaky" when sampling once from the upper respiratory tract. Although, there aren't any sampling details in this paper either (I'll blog about this paper another day)! I've plotted the all the publicly available mentions of asymptomatic MERS-CoV infections, by week, in the graph below (the bottom panel). The yellow peaks show that cases without illness usually correlate with healthcare workers in the graph above, during hospital and healthcare facility outbreaks (see my previous post describing the pink graph in the top panel). This isn't too surprising. The majority of disease associated with MERS-CoV infection arises in older males who already have an underlying disease including diabetes mellitus, cirrhosis and various lung, renal and cardiac conditions. Healthcare workers however are usually younger and do not have, or have not yet developed, such comorbidities. MERS-CoV is often a shown to be a bit of a bully when challenged by a healthy younger host's immune system. Although, when hit with a larger primary dose of virus from an infected camel, even the healthy can get hit very hard. Healthcare workers can be the 'canary in the coalmine', except singing about a healthcare outbreak rather than a gas leak. Similarly, laboratory confirmed MERS-CoV infection manifesting with only mild or no signs and symptoms of disease, also serve this role as a sentinel of hospital, rather than camel-to-human, transmission of MERS-CoV. Infectivity of an Asymptomatic Patient With Middle East Respiratory Syndrome Coronavirus Infection. Below is a quick look at the percentage of total Middle East respiratory syndrome coronavirus (MERS-CoV) cases reported each week that are listed as being healthcare workers (HCWs). The sources of the numbers used in this graph. These data are curated by me for this blog in my spare time and are compiled from the Kingdom of Saudi Arabia'a Ministry of Health (MOH) daily reports, the World Health Organization (WHO) disease outbreak notifications (and relatively new line lists) and from the FluTrackers line list. I use the same numbering as FluTrackers use in an attempt to produce at least two lists that agree on numbering and content. Some other things to note about this graph.. Sometimes there might be just 1 HCW and 1 patient - which would give a pretty big looking 50% positive (1 divided by 2). But clearly, it is just 1 HCW. So proportion (%) alone is not a whole lot of use sometimes. One needs to know the denominator (the bottom number of a fraction) to get a gauge of how big the problem really is. The current June hospital outbreak in Saudi Arabia includes three facilities in Saudi Arabia according to the WHO and the MOH. [1,2] From the 47-year old male reported on the 1st June as an index case in one facility, there have been about 44 secondary MERS-CoV detections (cases) in Riyadh. 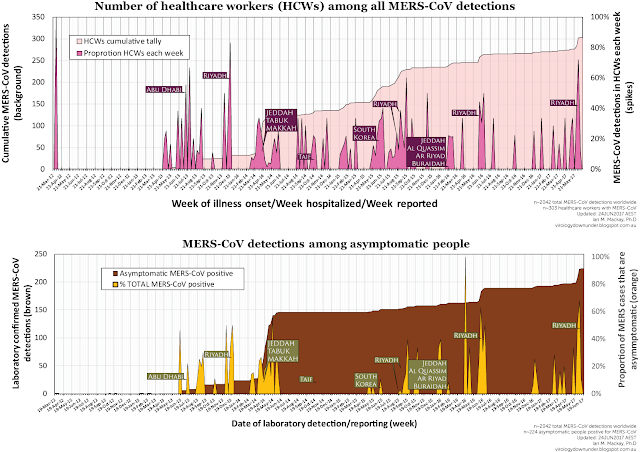 Of the 44 MERS cases, 26 are listed as HCWs; 18 of 25 HCW MERS cases occurring in a single week (week beginning 5th June) and accounting for the 72% spike seen at the end of the graph above. Just to confuse things, there were 3 distinct hospital outbreaks that occurred previously, in April and May, but it's not clear whether they contribute any cases to the June tally. There has been no other successful effort, by anyone, to produce a single public MERS case list with a universally agreed upon numbering scheme that contains useful but deidentified case detail, that everyone could refer to and use. The same applies to the influenza A (H7N9) virus as well. This has only been achieved by public volunteer bloggers; FluTrackers and this blog. Pretty poor when you think on it. I'm in a reading and watching phase at the moment - not much time for writing. Two videos I've recently come across are so good that I've embedded them below; they are just so good at describing their topics. These two vids are also just important science communication tools for all of our everyday lives. Show your kids. So I've bookmarked them as much for my own future reference as for yours. 1. Why reducing carbon emissions matters. This was lifted from an article at The Conversation. 2. Denial 101x: five characteristics of science denial. This was also lifted from a longer article in The Conversation. Quite a few more than I listed yesterday. 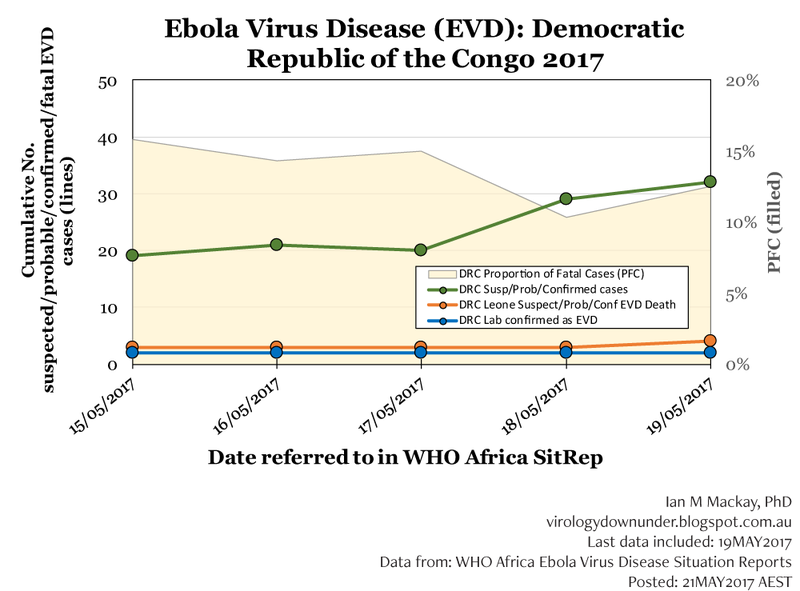 Latest EVD figures form the DRC. No borders are closed to travellers from, or who have travelled through, the Democratic Republic of the Congo, which is good news. Presumably this screening relies on the appearance of signs of illness, questionnaires and perhaps thermal camera images to identify feverish people. As I alluded to yesterday, these efforts are not very effective at actually picking up EVD cases from among a milieu of other febrile illness that stumble through a port of entry. However, these screening efforts do play a role in making citizens and politicians feel better and more useful. The precautions may also be helpful in keeping travel flowing. Whether the continued flow of travel during an epidemic that may leak from a hotzone is a good thing or not will no doubt (once again) be dissected after a more more transmissible pathogen sweeps across the world I expect. 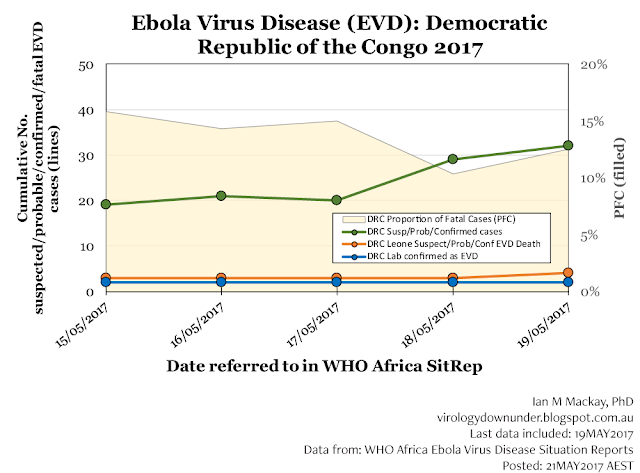 The World Health Organization have apparently found an outlet for their Ebola virus disease (EVD) reports for 2017's Democratic Republic of the Congo outbreak. It's not the Disease Outbreak News site. It's not the WHO media page. It's not any of the past EVD outbreak pages on the central WHO site. Turns out the Situation Reports (SitReps) are to be found on a new page on the WHO African site. Okay. Why not? Found it eventually. I've plotted the first 4 (they started from 15th of May) below. Not much to say about trends at this early stage obviously! Don't go expecting to find how we got to the totals shown on the 15th - those may well be lost details. Or they may come out later. We'll have to wait and see. 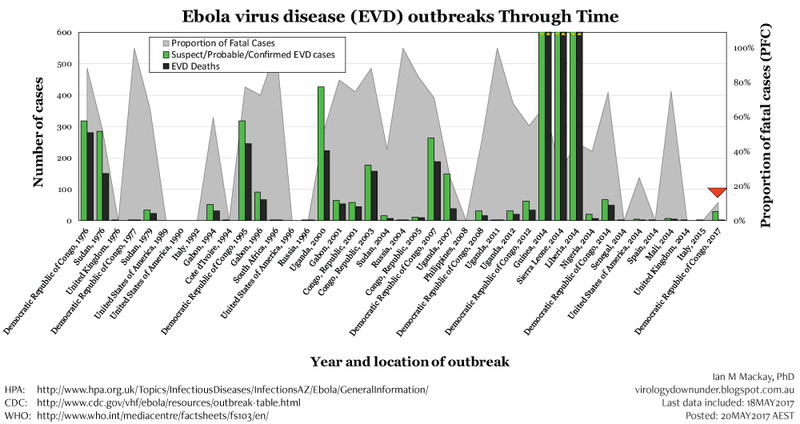 Outbreaks viewed from the public point of view are very much about patience and trying not to leap to any dramatic conclusions - like those decisions taken by at least one country in Africa to start screening passengers for signs of EVD. It's your budget guys - spend up if it makes you feel safe. At this stage, and perhaps ever, its a pretty wasteful exercise though; apart from your citizens seeing you doing something. Back to numbers. I'm pretty impressed with the WHOAfro SitRep - the 4th Report carries a detailed table of cases, deaths and locations and also a timeline graphic (below) which is fantastic. Click on image to enlarge.This image is part of SitRep No.4. And to wrap up, just for a glimpse of what has come before and where we are now (and because I promised @kristindownie I would! ), I've also added an updated "EVD through time" bar graph. Where we are with the current outbreak total is highlighted using a red arrow and the towering totals of West Africa are indicated by yellow arrows.